A photo of colorful buildings was shared with us from one of our staff in Singapore on her way to work. You can find this location on a map of East Singapore in a famous area known as Katong where Peranakan culture is still thriving today. There are restaurants serving delicious Peranakan cuisine as well as an array of traditional coffee shops. The Peranakan, descendants of Chinese immigrants, settled in this area in the latter half of the 15th century. They married the local women and introduced Malay and European culture to Chinese culture bringing forth a new life style. This unique life style, curated by the Peranakan, is referred to as Peranakan culture. The picture we introduced shows buildings known as “shop houses” exhibiting characteristics of Peranakan culture where the first floor is designated for a shop or office and the second floor is used as a home. In the case that the first and second floor are both used as a home it is called a “terrace house”. Another characteristic of the Perankan culture are the pastel colors seen on the buildings. It seems that they favored a mix of European baroque/gothic styles, Indian, Chinese, and East-West styles which all found its way incorporated into a colorful assortment of clothes, accessories, and dishes. As an extension of this style, a variety of brightly colored buildings were built to form a colorful cityscape. Just walking down this street puts you in an undeniably good mood. 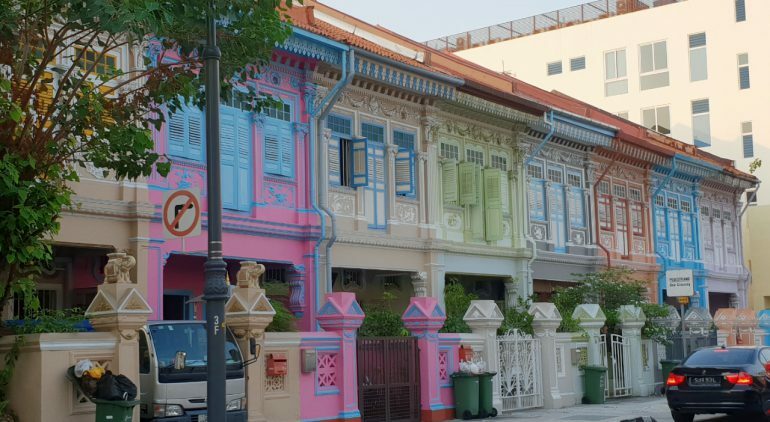 Using Propre we were able to find 8 Peranakan style terrace house property listings. At a price of about 200-300 million yen, it is an average price for a property in Singapore given the market price of the surrounding area. Taking into account the historic value and cultural background associated with the property, it may even be considered a bargain.